Come gather around the flame to cook these decadent yams, mashed with maple syrup, apple cider and spices, and layered with candied pecans & mini marshmallows. Toss yam slices with olive oil and pumpkin pie spice. Place yam slices on a medium-hot part of the Artflame.Sprinkle with sea salt and flip when starting to brown.Place the cast iron skillet on grill, and place 3/4 of the stick of butter in skillet to melt.Remove yams when cooked. Rough chop yams and place in skillet with butterPour in 1 tablespoon brown sugar, apple cider, and pinch of ground cloves. Mash yams with a fork and cook until the liquid is absorbed.Place pecans on grill with 2 tablespoons brown sugar and the rest of the butter. 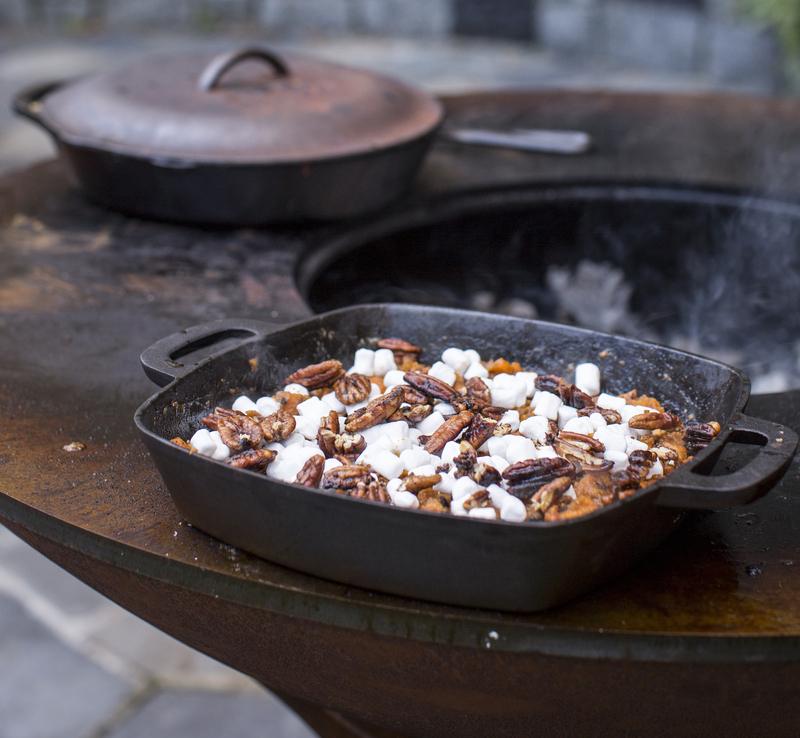 flip often until browned being careful they do not burn.Crumble pecans and sprinkle marshmallows over yams in skillet and remove from grill. Keep warm in a 200 degree oven, covered, for up to 2 hours.